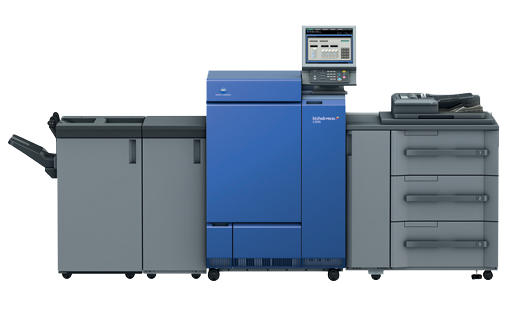 The Konica Bizhub Press 1100 is a high speed multicolor digital production press that offers near offset printing results. It has the capability of producing 100 pages per minute, and produces superior results for your printed marketing pieces. The Konica 1100 has outstanding image retention with enhanced toner for a wider range in the color gamut, providing consistent color throughout the length of a press run. It’s volume capacity will allow us to be even more competitive in our estimates on various print projects. Minute Print Inc. is excited for the possibilities in enhancing your print projects and to do so with greater efficiency and cost savings to you. We look forward to servicing your account! In the market for custom printing? Shopping for printing services? Our knowledgeable and skilled printing experts can produce quality printing of any kind. While we specialize in one and two-color printing, we pride ourselves on short-run full-color printing as well. Minute Print's computer-controlled direct-to-plate system offers digital accuracy and consistent quality for any print product you need. We’re experienced in printing for all levels of business, delivering quality print products in one, two and four-color letterhead, envelopes, business cards, forms and marketing pieces. We’ll undertake your custom printing projects, work closely with you to provide whatever print services you need, and be sure to deliver what you need right and right on time. Our digital presses enable us to offer short-run, full-color digital printing for your sales literature or direct mail pieces—but that's only the beginning. We can also provide flyers, labels, posters, pocket folders, and other print products. To learn more about the many products and services we offer, please contact us at info@minuteprint.net or use our online order form.